Michael Jordan’s brother James “Ronnie” Jordan has served many years in the Armed Forces, and as a tribute, this Air Jordan Retro 1 (I) Pearl White / Hay / Walnut is dubbed Armed Forces and Military Jordan Retro 1. 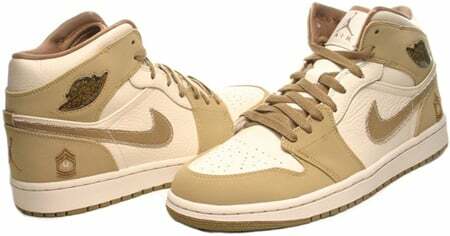 Ronnie Jordan recently served time in Iraq, and since its made up of desert, this colorway of the Air Jordan Retro 1 (I) Armed Forces Military features a “desert theme”. Also, at the heel is featured Ronnie Jordan’s rank. Releasing May 24th 2008, which is Memorial Weekend.